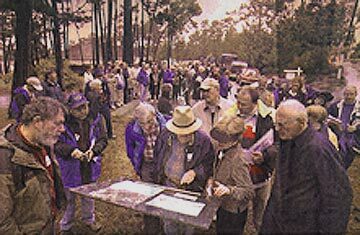 Above: Pebble Beach residents and county planners gather at the first stop on their field trip through Pebble Beach, touring the sites of proposed development. They were looking at plans that have been posted at the site of the proposed construction. Scattered in the green maze of the Del Monte Forrest of Pebble Beach are fluttering red flags and strands of orange plastic netting, markers for an ambitious makeover that owners of the golf resort and high-end residential area hope to see to completion over the next two years. The Pebble Beach Co. gave a daylong guided tour Wednesday of 25 sites earmarked for development by the company's Del Monte Forest Preservation and Development Plan It drew 60 observers, including the zoning administrator, members of the Monterey County Planning Commission and Subdivision committee, company representatives and interested members of the public. The expedition assembled at the Carmel Hill fire station just inside the Pebble Beach gate at Highway 1 in a drizzling rain that quickly gave way to scattered clouds and sunshine. The tour was meant for policy makers, according to Thom McCue, county project planner, but was thrown open to whoever was willing to brave the weather, pack a sack lunch and devote seven hours to rolling through the forest in a convoy of Pebble Beach Co. vans. Eleven stops were made at areas where "storyboards" were set up outlining what is planned in a particular area, with flags and outlining visible to show building locations and sizes. Roxayne Spruance, who handles environmental questions and complaints for the company, came along to answer questions about what Pebble Beach Co. would do to mitigate impacts. The Del Monte Forest Preservation and Development Plan calls for construction of a 216 acre, 18-hole golf course, a golf driving range, a total of 160 visitor-serving suites at the new golf course as well as at The Lodge at Pebble Beach and The Inn at Spanish Bay, relocation of the Pebble Beach Equestrian Center to a 41-acre site in the Sawmill Gulch area, creation of 33 residential lots within five subdivisions, construction of 60 employee housing units, and relocation and construction of roads and trials. The plan also calls for preservation of 492 acres ** of forest land and critical wildlife habitat. The proposed developments were the subject of a countywide ballot referendum that was approved in November 2000 by 64 percent of voters. ** The ballot measure, pushed by the Pebble Beach Co., played up the preservation of the forest land and a reduction in the number of allowed single family houses. Biological: Developments in pine forests, areas where endangered plants grow, sensitive habitats. The company will mitigate those by reducing building sizes, land management, restoration, project redesigns and setting aside 492 acres in conservation and preservation easements. Water: Pebble Beach Co. has already addressed irrigation demands with its reclaimed water project. Traffic: A redesigned entrance to Pebble Beach at Highway 1 and Highway 68 and road changes inside the forest are planned. Construction: Management plans to control dust, noise and traffic while the project goes on are in place. The project plan will be discussed by the Pebble Beach Land Use Advisory Committee at its March 11 meeting and by the county Subdivision Committee on April 8 in Salinas. The county Planing and Building Inspection Department is accepting comments from the public and agencies, including the California Coastal commission, or the company's 1,200-page draft plan ** through March 22. County Planning and Building Inspection Department, coastal office, 2620 First Ave., Marina, where a CD-ROM of the report may be purchased. Public libraries in Carmel, Carmel Valley, Monterey, Pacific Grove and Seaside, and the Steinbeck Main Branch Library in Salinas. Pebble Beach Community Services District office, Forest Lake and Lopez roads, Pebble Beach. The document may be also purchased at Kinkos, 799 Lighthouse Ave, Monterey, or 501 S. Main St., Salinas. Call them at 373-2298 or 769-9855 for a price estimate. See Concerned Residents comments on this story (below). The February 18th tour of the Forest was scheduled and lead by Thom McCue, County Senior Planner. The Pebble Beach Company provided vans and assisted the County in directing the tour to each construction site. The voters did not approve this development as stated in the Herald. In November 2000, county voters approved Pebble Beach Company's Initiative, Measure "A". The Measure "A" Initiative was placed on the ballot to change land use zoning and policies in the Del Monte Forest. These changes will only be effective if they are approved by the California Coastal Commission. Measure "A" does not approve the Pebble Beach Company's proposed development plans. The Pebble Beach Company's development plans and pending applications for major construction projects must be approved by the County Planning Commission, the Board of Supervisors (see schedule below) and the California Coastal Commission. These plans will become effective only if the Coastal Commission first approves Measure "A" and then the proposed development plans. This article refers to the "Company's 1200 page draft plan." Rather, it is a Monterey County Draft Environmental Impact Report prepared by the consulting firm of Jones and Stokes for Monterey County. This story neglected to include the answer to the frequently asked question: "How many trees will be removed by this project?" Answer: 15,391 Monterey Pines and 1,769 Coast Live Oaks, for a total of 17,160 trees removed. Reference was made to the preservation of 492 acres of Forest land. Measure "A" and the Pebble Beach Company's development dedicates only 265 acres to new Open Space in the Forest. The remaining acres were placed into Open Space Forest in previous years. The County Del Monte Forest Land Use Advisory Committee will hold Public Hearings on March 11, 12 (and if needed on the 15th) at the Pebble Beach Community Services District offices at Forest Lake and Lopez Roads in the Forest. The Public is invited to attend and speak. The committee will discuss, listen to public comments, and then vote on each construction project covered by the ten pending applications. The committee vote and recommendations will be forwarded to the County Planning Commission.